Here's some great video from my visit to the school last week. Last week a big load of books had arrived from Canada. A couch surfing connection enabled us to get a third of the books up to the village. I went up personally (first time in four months). The students and staff are overjoyed by the books and all the international visits they've been getting! My friend Jed's restaurant has an amazing window that let's in beautiful light. One morning inspiration struck. 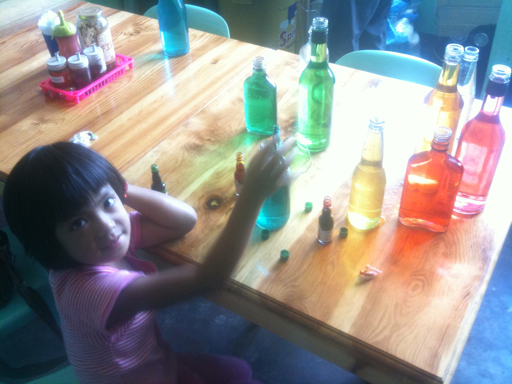 I've used glass bottles and food coloring in exhibits back in Canada. 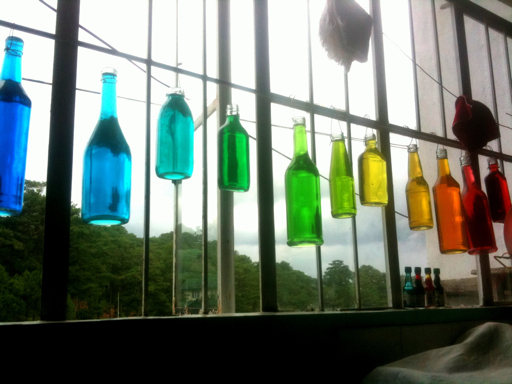 Why not bring some light to Sagada? I dutifully collected bottles from my house parties over the last month, and soaked off the labels. My little friend Dianne helped me concoct the colors. Sammi the cook helped me hang them, and my friend Angela was able to bring the colors of the rainbow up with her from Manila. And here it now hangs! I just love the radiant colour effect! 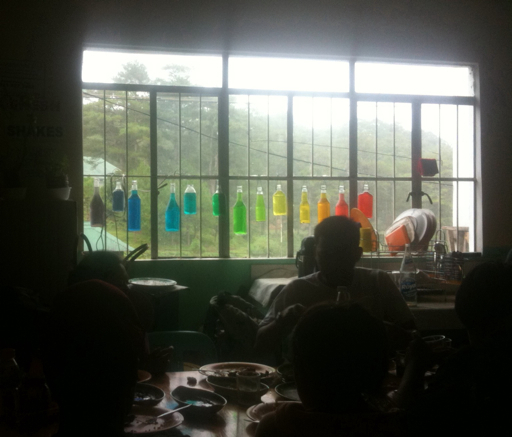 I can sit there at Jed's restaurant with my morning coffee and just stare at the luminous colours for a good moment! Depending on my mood one colour or another draws me more. The technique is so simple. I highly recommend it! 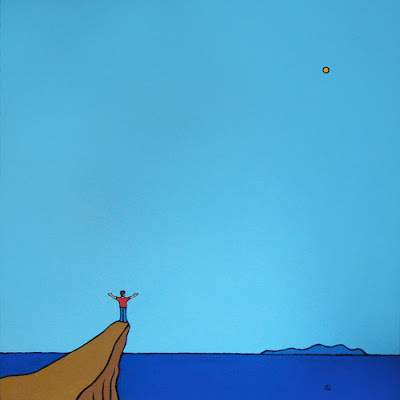 Well, I haven't blogged for a while. As usual this not because there hasn't been anything to blog about-- but rather too much! I just got back from a momentous two days in the mountains. Packages or books have arrived from Lorraine in Canada and Jane and Claire in Australia. 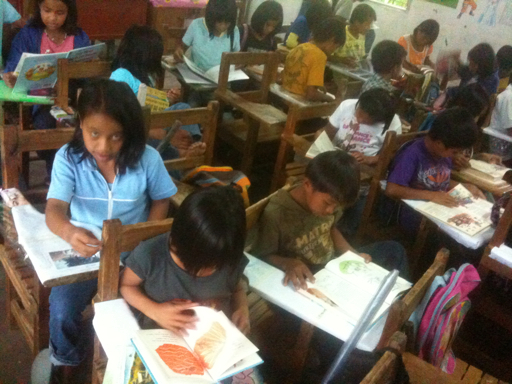 With the help of Laura from Spain and Irina in Manila we got half of Lorraine's books up to Sagada. It's truly an epic collaboration! Laura and I then made the journey to the school together. What a luminous pleasure to deliver the books. The staff had been delighted the day before to receive Jane and Clair's books (and photos of their "jolly" visit teaching there). In the big box we brought up, there were dozens of awesome quality books. Thank you Lorraine! 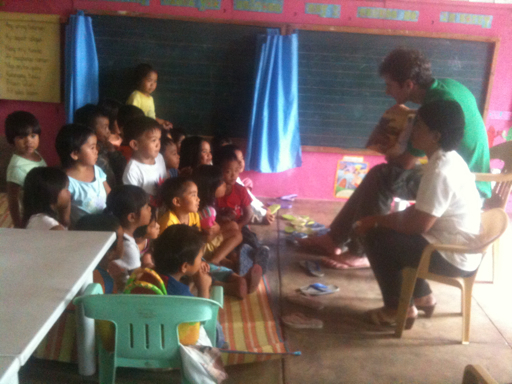 I spent the day visiting each of the classes and reading stories. The students gathered round in ecstatic silence round as I flipped through "The boy who fooled the giant", "Thumbelina" and "Little Red Ridinghood". 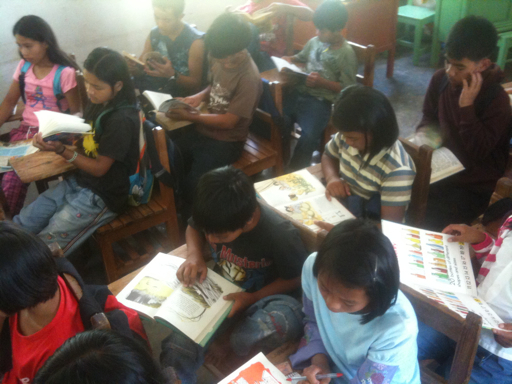 These kids have never seen beautiful books like these. There was a moment when I looked up from my reading to see three dozen wide open eyes staring with rapt attention at me and the pictures. I breathed deeply to take it in. Wow. What a beautiful and fufiling moment. After several classes, my voice was getting a little dry from my animated readings. So, I decided to try something else. I brought the entire box up and handed the books out to all the pupils. Amazing! Despite the random distribution, the kids fell I to a rapt silence-- they devoured with their eyes and fingers the beautiful pictures, words and photos. I might as well have been handing iPads out to a class of Canadian students! Another box awaits in Manila, Ray has a big crate coming from Manila, and I just got a message from my Mum that she can send some too. Slow and steady the collective intention blossoms!